Following feedback from past participants, the new and improved course now focuses solely on teaching practice. Interns now complete an online TEFL prior to departure – all included in the price! When in China, interns will observe each other in the classroom, reflect on their practice and learn strategies that will help them when they head to their school. Interns will now begin their adventure in Beijing. For the first two days, interns will get to see the great sites, including the iconic The Great Wall of China. The group will then travel together to Harbin (North China) on the border of Russia. There is so much to do there – including visiting the largest big cats park. If interns are lucky enough to come in winter, they will get to visit the legendary Ice Sculpture Festival. After training, interns then travel in small groups to their school in another area of China. This guarantees that interns will experience 3 very different unique areas of China. As the training is now 2 weeks rather than 4, interns gain more time at the end of the teaching internship to travel China before their visa expires. With such easy transport links, interns can travel vast distances and this is a real highlight. Great news the programme is £2361 for 26 weeks. When you are teaching, you will receive a monthly allowance of £250 and a completion bonus of £300 – making your time in China more cost neutral. 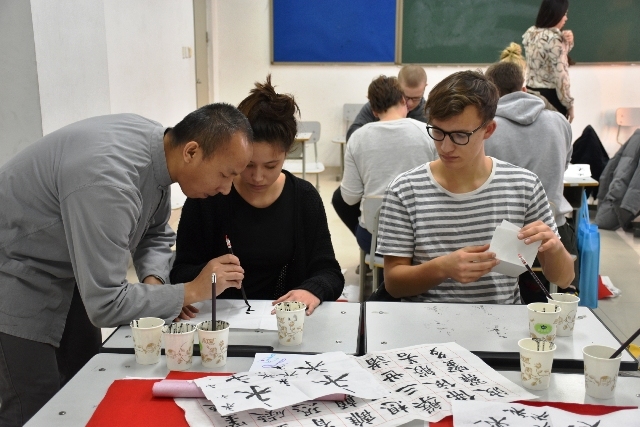 This fantastic price includes accommodation, 3 meals a day, Beijing sight seeing, welcome meal, visa support, 24 hours support, all in-country transport, calligraphy lesson, Tai Chi lesson and to top it all off… Mandarin lessons (2 hours a week)! If you are interested in joining our Summer 2017 or Winter 2018 programme, contact Sarah or call her on 01892 771973.